From left, G. Richard Smith, M.D., professor of psychiatry at UAMS. ; Curtis Barnett, Arkansas Blue Cross president and CEO; Gov. Asa Hutchinson; and Stephanie Gardner, Pharm.D., Ed.D., UAMS interim chancellor, announce the creation of AR-IMPACT, an education and consultation video conference service for Arkansas health care providers on the topic of opioids. April 30, 2018 | April 30, 2018 | The University of Arkansas for Medical Sciences (UAMS) has launched a free weekly education and consultation service for Arkansas health care providers to better manage chronic pain patients and those who need their opioid dosage reduced. Arkansas Improving Multidisciplinary Pain Care Treatment (AR-IMPACT) was announced today at a news conference at the state Capitol with Gov. Asa Hutchinson, Arkansas Blue Cross and Blue Shield, Arkansas Drug Director Kirk Lane and partnering agencies: the Arkansas Medical Society, Arkansas Academy of Family Physicians, the Arkansas State Medical Board, the Arkansas Department of Human Services and the Arkansas Department of Health. 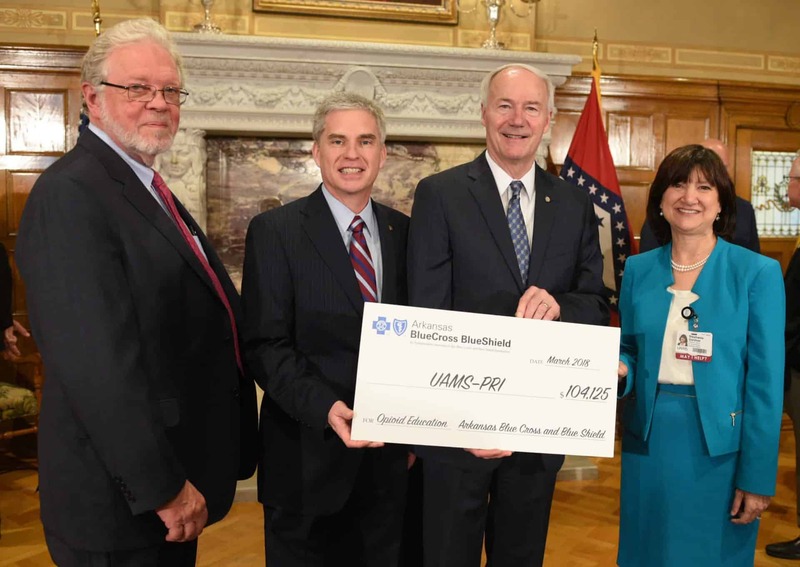 Funding for UAMS AR-IMPACT’s first year has been provided by $104,125 from Arkansas Blue Cross and Blue Shield and $49,000 from the office of the state drug director. UAMS AR-IMPACT is a live streaming online video conferencing service staffed by a multidisciplinary team from UAMS, including a pain physician, addiction psychiatrist, a psychologist, two pharmacists and a physical therapist. For more information, go to arimpact.uams.edu. Each weekly conference will include a 20-minute presentation on an opioid-related topic and a question-and-answer session. Participants are encouraged to present patient cases for individualized feedback about approaches to treatment. Physicians, physician assistants, nurse practitioners, pharmacists and other health care providers are welcome to use the service and will be able to earn continuing medical education credits. Topics will include how to taper off opioids, alternatives to opioids for pain management, when physical therapy is appropriate, when to recommend a nerve block or an epidural and more. Smith said participant interest will guide future topic choices. UAMS AR-IMPACT is the latest of UAMS’ efforts to respond to the opioid epidemic which include reducing opioid prescriptions while improving patient outcomes, re-educating staff, treating overdose patients and treating opioid addiction through medication and group therapy. Research to improve understanding of opioid addiction and its treatment is ongoing in departments across campus.